Do you enjoy working with people and resolving problems? Are you talented at seeing the different talents and potential that others possess? For people who love working with all kinds of different individuals and matching talents and interests to different positions, online human resources degrees could point them in the direction of an extremely fulfilling career. Human resource professionals manage the most important resource of any company: its employees. As a human resource generalist or human resource specialist, you could be involved in recruiting, job placement, benefits and compensation, workforce planning and development, and many other integral parts of any company. Because every company needs happy, productive employees, there is a huge need for human resource professionals in all industries and fields. If you’re interested in learning how to succeed in the human resources profession, a bachelor in human resources is the next logical step. Such a degree will provide you with an exceptional understanding of the profession, a knowledge of best HR practices and ample opportunities for real-world work experience. Earning your degree in human resource could jumpstart your career and pave the way to a long career full of variety and fulfillment. Although a human resources degree is widely available at thousands of notable colleges and universities across the nation, there are still many individuals limited by geographic region, financial means, or simply time requirements. You might already be in the workforce, or across the country from your university of choice, or perhaps you’re simply uninterested in attending a university in the traditional manner. For anyone looking to earn their bachelor degree in human resources at a faster pace, on their own time, or in their own home, online schooling can be a phenomenal option. Many top-tier universities across the country offer the ability to complete a degree completely online while providing great value and a quality education. Oklahoma State University “exists to prepare people to make a difference in the world by teaching essential interpersonal skills alongside a high-quality business education backed by impactful research and outreach.” Oklahoma offers a graduate certificate in human resources that allow students to complete the credentials in less than a year without having to obtain a master’s degree. Those students who prefer online will also receive the high-quality learning experience associated with Oklahoma State University. Geneva College is “a Christ-centered academic community that provides a comprehensive education to equip students for faithful and fruitful service to God and neighbor.” Geneva was founded in 1848 and named after Geneva, Switzerland. Approximately 1700 students are enrolled in the school, and nearly 100% of first-year students receive financial aid. With the ever-growing availability of online courses, Geneva is a great place to get an HR degree. Rasmussen College Online offers the total package for potential online students. With affordable tuition, an outstanding graduation rate, and the same academic rigor online as on campus, this college is an incredible option for online HR degree seekers. Although the online Bachelor in Human Resources and Organizational Management can be completed 100 percent online, Rasmussen College offers the opportunity for increased engagement, working on real-world projects and connecting to professors and peers online or in-person. Also, for those seeking an accelerated course of study, Rasmussen College allows you to complete the online degree in as little as 18 months. Amberton University was founded in 1971 and is known for its Christian values and the number of students who pass exams. Amberton is specialized to meet the specific needs of students and teaches them the skills needed for a career in the workforce. The online courses provided are taught by the same professors who teach on-campus classes and are identical in the curriculum. Founded in 1915, Webster University was one of the first Catholic universities west of the Mississippi. Webster seeks to be as unique as each individual student they educate by providing a globalized curriculum. Webster is a private, non-profit university with locations on four different continents and enrolls over 14,000 students. Pittsburg State University offers abundant opportunities for internships, cooperative education, independent projects, and other kinds of hands-on learning. Students can have their choice of over 150 programs in four different colleges, 47 of which are offered online. Their Human Resource Degree, in particular, is a 34-hour degree taken by students seeking flexibility and convenience. Trident University was established in 1998 and is one of the universities known for their online programs. With excellent quality and experience educating over 30,000 students, Trident should definitely be on the list! Trident especially caters to all branches of the military with grants and programs for veterans and enlisted soldiers. The University of Arkansas in Fayetteville was the first public university established in the state and currently, serves more than 27,000 students. The University also has a strong online student population of over 1,700. The online Bachelor of Human Resource and Workforce Development pushes students to develop real-world skills and experience through the core classes as well as a requirement for a few years full-time work experience to graduate. Online students have access to the student resource network and pay an affordable in-state tuition. DeSales University is a private, four-year, Catholic University. With small classes and faculty-to-student ratios, DeSales is a fantastic college for all types of degrees and subjects of study. DeSales believes it’s important to keep the quality of all classes, no matter how they are delivered. Online Bachelor, Master, and doctoral degrees are offered with all the online resources available. Robert Morris University is a military-friendly school that offers personal attention and professional focus. Military veterans are offered generous college benefits and online students are offered a learning experience that is identical to an on-campus experience. Robert Morris strives to go beyond what is expected to give students the best educational experience available. This university out of Hampton, Virginia focuses on providing a flexible online schooling experience while still providing exceptional support with a wide variety of student services provided by real-life faculty members and university employees. The online Bachelor of Science in Systems Organization and Management from Hampton University has a specific concentration in Human Resources Management, focused on preparing students HR Management certification. The degree provides an excellent foundation in accounting, economics, and communication skills before more specialized courses focused on developing important professional skills and understanding. Fort Hays State University is known for many things besides its excellent Human Resource programs. One of the top-notch schools in the nation, Fort Hays is a winner. The university offers online programs for professionals who are self-motivated and independent, using the best technology so students can stream wherever they are. With the ability to stay in contact with faculty and other students, Fort Hays promises to provide the highest quality resources and answers when needed. Concordia University in St. Paul, Minnesota provides options for both undergraduate and graduate degrees in human resources. The online Bachelor in Human Resources Management is a 128 credit hour program emphasizing topics like legal issues in human resources, staffing, compensation and benefits, and organizational development. Ninety-two percent of CSP students find employment upon graduation. The 40 credit hour human resource program is made up of seven-week courses provided in an asynchronous format. No live class time is ever required for an online degree at Concordia University. The University of Mary is a private, Catholic university. Offering online and evening classes, students are able to obtain their degree and concentration in as little as 18 months. Mary uses state-of-the-art online learning programs and experienced faculty with real-world experience to give students quality education as they pursue their degree online. Campbellsville University is a Christian institution that offers, certificates, associate’s, undergraduate and graduate programs. Campbellsville University is accredited by the Southern Association of Colleges and Schools Commission on Colleges (SACSCOC) and is considered one of the most affordable Christian colleges in the nation. Campbellsville has over 30 online programs in addition to on-campus programs to provide flexibility and self-scheduling for students’ increasingly busy schedule. Cleary University was founded in 1883 and is an independent, non-profit business university. Cleary is accredited by The Higher Learning Commission and is constantly focusing on understanding and improving their services. Cleary understands Human Resource Management plays crucial roles in all businesses and strives to output skilled and experienced graduates for the workforce. With its base in Greenwood Village, Colorado, the Colorado State University-Global Campus provides online students with the programs and resources to jump into a successful career as a human resources professional. The Bachelor of Science in Human Resource Management is offered at an accelerated pace using an eight-week course length. All courses are available each term in an asynchronous format providing online students with total flexibility and the ability to tailor their course schedule to their individual situation. Penn State University offers many top programs in the country for various degrees, both online and on campus. The online Bachelor in Labor and Employment Relations offered from this university is no exception. The university offers two options for online HR degree seekers: either a bachelor’s of science or a bachelor’s of arts in Labor and Employment Relations. The experienced faculty at Penn State are experts in areas like human resources, employment and labor law, international human resources and employment relations, organizational behavior and workforce diversity. Both online bachelor’s degrees prepare online students for successful careers as either HR generalists or human resource specialists. The online BBA with a concentration in Human Resources Management from Southern New Hampshire University is one of the top online human resources programs. It’s also a 120 credit hour program recognized by the Society for Human Resource Management, the world’s largest HR membership organization. SNHU provides students with both academic and career advisement to help students maximize their education and internship and job opportunities. The university is also transfer-student-friendly allowing online students to transfer up to 90 credits towards their degree. With 24/7 access to course materials, students can choose their own pace of education during the six eight-week terms each year. Georgia Southwestern State University is a comprehensive, four-year institution that encourages intellectual, personal and social growth. Founded in 1906, Georgia has extensive experience in awarding students bachelor and master degrees. Students who have received their Associate’s degree may apply for a bachelor’s degree in human resource management entirely online to fit their needs. Mckendree University has been serving the Illinois and St. Louis area for over 200 years. The university has a created a supportive online education system providing students with personal advisement and other valuable student services. Online courses are capped at twenty students to help experienced faculty members give more personalized instruction and support to their students. The 120 credit hour BBA with a concentration in HR Management provides students with a strong base of understanding of math, science, and English and includes interesting higher level courses like International Business and Consumer Behavior. Grantham University allows online students to begin classes at the beginning of any month of the year, so pursuing a BBA concentrated in Human Resource Management can begin at any time. The 124 credit hour program is provided at a very reasonable tuition cost. Grantham’s online degree helps students gain skills in things like recruiting, labor relations, interviewing, compensation, strategic planning and more. The Lenexa, Kansas university also fully aligns with the SHRM’s curriculum and guidelines, preparing students for a professional certificate program. The University of Southern Indiana was founded in 1965 and offers students more than 100 areas of study. With experience in educating over 40,000 alumni, USI understands that today’s students will be tomorrow’s businessmen. USI offers online programs in human resource management that can be completed in as few as 11 months. They provide expert knowledge and insight into the many different branches and responsibilities of human resource management. Marygrove College was originally started by nuns who wanted to give young women the opportunity to learn things such as arithmetic, music, beadwork, needlework, French, English, tapestry and more. Now, Marygrove is a full-fledged college that strives to give its students the education needed for critical thinking and progress in their behavior before God. With careful attention and instruction from qualified staff, Marygrove is an exceptional learning environment. Park University provides over 30 online programs in a quest to make earning an undergraduate or graduate degree more flexible and convenient. This school in Parkville, Missouri provides a 60 credit hour BBA concentrated in Human Resources Management. A 21 credit hour minor program in the same area of study is also an option for students looking to only begin their HR education. The program helps online students develop a strong business foundation, but also provides more concentrated instruction in things like planning and staffing, employment law, and compensation management. Winthrop University was established in 1886 and is dedicated to being the very best establishment of its kind. Winthrop offers online courses, hybrid courses, and technology-enhanced courses to enhance the education experience. Along with training and technical support, online classes are also taught by experienced professors who design the curriculum themselves. Philadelphia University Online provides a unique and student-focused approach to online education. The university has constructed its online education system on a foundation of collaboration, connection, and relevant skills, helping students to develop valuable and applicable skills and experiences for a career in Human Resources. The 120 credit Bachelor of Science in Human Resource Management can be completed in between two and three years and employs eight-week courses. Courses include things like organization, management, technology, evaluating statistical data, and decision making. This university based in Salt Lake City, Utah takes a novel approach to higher learning. Founded and supported by nineteen U.S. Governors, Western Governor’s University was created based on the idea of accessible distance learning. The online Bachelor in Human Resource Management from WGU prepares students for both the Professional In Human Resources Certification Exam and the Assurance of Learning Exam. Key focus areas of the degree include business, accounting, economics, marketing and communication, and quantitative analysis for business. California Southern University seeks to match the growth of the Human Resources field with a competitive online BBA concentrated in HR Management. The university, like many other schools, provides a strong foundation in core business and communication skills but also pushes students to the front of the crowd with instruction in supervisory management, labor relations and collective bargaining, compensation management, employee training and human resource development, and staffing organizations. Students with an online degree from California Southern University will be well-prepared to stand out in an increasingly competitive field and enjoy a successful HR career. Regent University, in Virginia Beach, Virginia provides a huge variety of online courses including a Bachelor of Science in Business with a concentration in Human Resources Management. The university has been recognized by the American Council of Trustees and Alumni as one of the top universities in the nation and provides students with the education and skills necessary to succeed as an HR professional. One unique option provided by Regent University is the ability to test out an online course before actually enrolling, allowing students to understand the online environment provided by the university. This university in Longview, Texas is a Christian school accredited by the Southern Association of Colleges and Schools Commission on Colleges. Apart from the three credit hours of Bible study required in the general graduation requirements, the HR concentration of LeTourneau University’s online BBA includes instruction in staffing, innovation management, compensation and benefits, and employment law. The university also prepares students for professional HR certification by constructing courses aligned with the Society for Human Resource Management. Athens State University originally began as a completely female academy in Alabama but has since grown to be the target destination for transfer students in the area with 4,000 students enrolled on an annual basis. The university provides a fully online BA in Human Resources Management. The program uses a mix of asynchronous and synchronous instruction to provide students with the ideal combination of flexibility and engagement while completing their online HR degree. Metropolitan State University is based in the twin cities area city of Brooklyn Park, Minnesota. The university points to academic quality, degree completion, and community involvement as its highest priorities. The majority of faculty members have continued their professional work, thus providing students with valuable real-world insights and education. MSU’s BS in Human Resources Management is 120 credit hours long and focuses on the SHRM guidelines in preparing students for professional certification. Waldorf University focuses on providing an extremely accessible online human resources degree. The university covers all textbook costs through the Waldorf Book Grant, provides an affordable tuition cost, and allows students with total flexibility by unscheduled online class sessions. Waldorf helps students even more by providing a large percentage of students with financial aid and waving an ACT or SAT requirement. The BBA concentration of Human Resources Management is also fully aligned with SHRM guidelines. Anderson University is a South Carolina school focused on creating leaders in the human resources field. Its online degree in Organizational Leadership with a focus in Human Resources Management provides students with the knowledge, experience and application practices necessary to set themselves apart in the job search and enjoy tremendous professional success. Courses within the program include things like organizational leadership, quality management, critical thinking, and business communication. The program also includes concentrated courses in training and development, accounting and budgeting, and computer information systems. Wilmington University currently hosts more than 18,000 students at its twelve different locations in Delaware, Maryland, and New Jersey. The school has also developed a global reach through its online programs including the BS in Human Resources Management degree. Although completely online, this online human resources program maintains an aspect of interactivity through email, chat, and discussion boards. The program relies upon well-organized and HR specific courses but also works to provide students with a strong skill set in business management. For a total tuition cost of $41,520, Wilmington provides moderate affordability for online degree seekers. 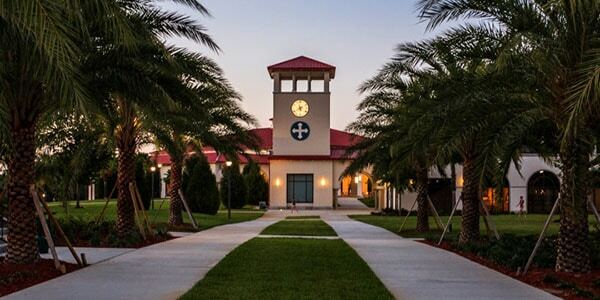 Saint Leo University in Saint Leo, Florida is one of the largest higher education Catholic universities in the nation and has supported online studies since the 1990s. The school provides an engaging online BA in Human Resource Management degree with student message boards, interactive online classrooms, and packaged digital course materials serving to prepare students for discussion and engagement with professors and fellow students. The program consists of courses like risk management, recruitment, training and development, and industrial and organizational psychology among others. Dickinson State University provides a total of thirteen online programs at Associate’s, Bachelor’s, and Master’s levels. The Bachelor of Science in Human Resource Management is made up of 120 total credit hours further divided into general, pre-major, business core, and HR management core classes. Dickinson State seeks to help students develop professional competencies in planning, leadership, problem-solving, and professional communication. Albany, New York is home to Excelsior College. One great fact about this college is its efforts to give students college credit for past training, work, or military experience. The Bachelor’s in Business with a focus in Human Resources Management provides instruction in labor relations, organizational behavior, negotiation, labor law, and business communications among other areas. The 120 credit hour program seeks to instruct students in such a way that, with increasing experience, they will become leaders in the field and impactful employees in any business sector. The University of Maryland University College rounds out this list with its Bachelor of Human Resources Management degree. This university offers more than 90 different online programs and provides students with the ability to mix online and on-campus courses if so desired. With over twenty locations, UMUC makes such an option much more viable for online students in the northeast. The 120 credit hour program allows students to take classes whenever they want as long as they meet weekly or bi-weekly assignment deadlines. As the field of Human Resources continues to grow, so will the availability and quality of online schooling options. Any of the schools on this list provide an exceptional education at a reasonable tuition cost while still providing the convenience and flexibility of academic options, whether they be on-campus or online. This list was ordered by creating scores for every school based on their reported graduation rate and tuition cost, each making up 50 percent of the final score. The schools were then ordered from highest score to lowest. See our methodology page for more information. If you’re interested in pursuing a Bachelor in Human Resources, take a look at any of the schools on this list. If your school provides a top-tier HR bachelor’s degree program but wasn’t included on this list, please contact us today for possible inclusion on a future list! In our next guides, we will write about the best master degree programs in human resources and human resources associates degree. *The Best Human Resources Degree Programs of 2017 guide has been updated.